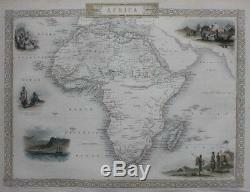 Size: the printed area measures approximately 325mm x 250mm, with margins beyond; blank verso. 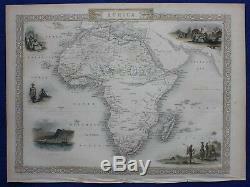 Description: A quite detailed and very decorative outline hand-coloured antique map of Africa. 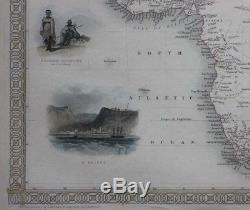 It is presented within a decorative border and is surrounded by several finely engraved vignettes titled'Bedouin Arabs Encampment','Korrana Hottentots','St Helena','Bosjesman Hottentots' and'Arab Family of Algeria'. Cartographer / Engraver / Publisher: map drawn and engraved by John Rapkin / illustrations by J.
Marchant / published by John Tallis. 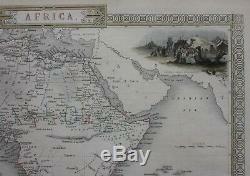 Provenance:'The Illustrated Atlas and Modern History of the World', London, 1851. Slightly uneven lower edge to the sheet where it was once bound into the source publication. 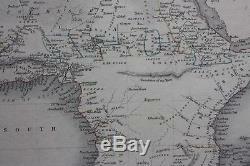 Four small pieces of tape verso where the map has previously been mounted for display. Please study all the photographs carefully to fully appreciate the condition. 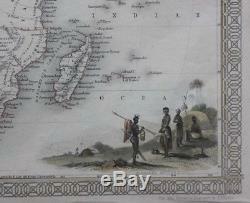 The item "Original antique map AFRICA, MADAGASCAR, Tallis, Rapkin, c. 1851" is in sale since Tuesday, January 1, 2019.